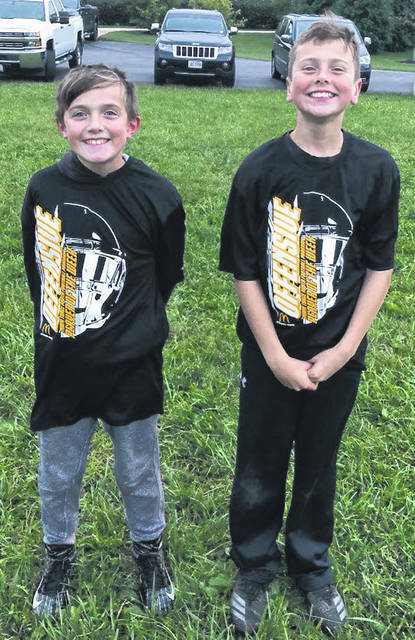 Miami Trace Youth Football Program Players of the Week for games played Oct. 13 and 14, 2018 are (l-r); Kooper Hicks, Defensive Player of the Week and Grant Guess, Offensive Player of the Week. In games played Oct. 13 and 14, the Miami Trace Varsity Gold team remained undefeated with a 15-12 win over East Clinton. The Varsity Black team lost to Jackson, 32-0; the J-V Black team fell to Jackson, 29-0; the Varsity White squad lost to Washington, 16-0 and the J-V White team fell to Washington, 26-0.